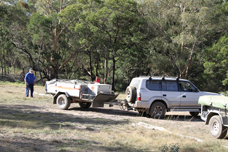 If you have purchased an off road camper trailer or off road caravan and are about to head out on your long awaited holiday or you are required to tow a trailer with a 4WD as part of your daily employment you simply cannot afford to miss this excellent training programme. You will attain an Introductory level of operation of a four wheel drive vehicle and vehicle recovery techniques. 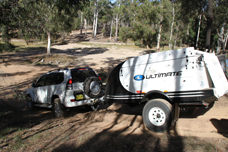 In addition to this you will be trained in how to tow your camper trailer or off road caravan on unsealed surfaces and over 4WD terrain. Trailer maintenance, trailer reversing techniques and daily checks are also covered in this must do course. 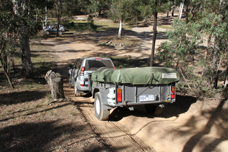 Your fee includes camping at our 4WD Venue, if you do not have camping gear we can arrange motel accommodation from $120 per double and Bunk House accommodation at $25 per person, shared accommodation and bring your own sleeping bag or linen. When making your booking please indicate your accommodation needs. 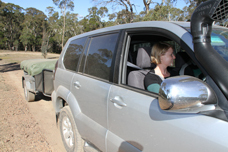 Off road driving including steep incline and decline, rocky river beds, mud and sand. Great Divide Tours owns an exclusive property on the outskirts of Braidwood in the Southern Highlands of NSW. Just 3 hours drive from Sydney, 2 hours from Wollongong and 1 hour from Canberra it is ideally located for easy access. This property has been developed with four wheel drive training in mind. Fully approved by Council this is a state of art training facility. 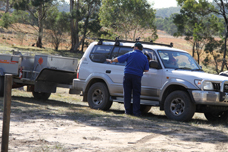 It is in a picturesque bushland setting typical of the type of terrain that you are likely to encounter when using your 4WD. The nearby town of Braidwood provides fuel, supplies and accommodation. Camping on the property is included in your training fee cost.